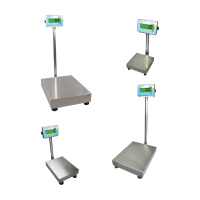 Warrior water-resistant weighing scales consists of bench and floor scale models constructed from a durable IP66-rated stainless steel base and sealed weight indicator for high-performance weighing, checkweighing and parts counting applications. The IP66 rated housing means the scale is fully dust-proof and can withstand powerful jets of water from a nozzle in order to meet the demands of washdown and clean room environments. The Warrior is ideal for a variety of industries including food, pharmaceutical, veterinary, industrial and manufacturing tasks. A dynamic weighing function facilitates liquid and chemical measurement in science laboratories, while checkweighing with coloured LED lights simplifies repetitive sample weighing in warehouse and production tasks. A large back-lit display allows for easy digit recognition, reducing the chance of errors when transcribing results. With data output via a RS-232 interface and optional relay triggers, the Warrior can be set to control other devices. Warrior scales feature durable, easy-to-clean stainless steel weighing pans and sealed indicator keypads that prevent damage from leaks or spills in food packing applications. A checkweighing feature with audible alarm notifies packers when a packaged product is either under of over the required weight limit. A built-in dynamic weighing feature allows chemicals and hazardous substances to be weighed effectively, whilst the chemical-resistant stainless steel weighing pan helps to prevent damage to the internal components of the scale. The Warrior's dynamic weighing feature can weigh an animal through a series of impressions left on the weighing pan; an average weight is determined based on several impressions. Floor scale models can be used for weighing larger pets such as dogs and reptiles, whilst bench scale models can be used for smaller pets such as cats, puppies and small marsupials.